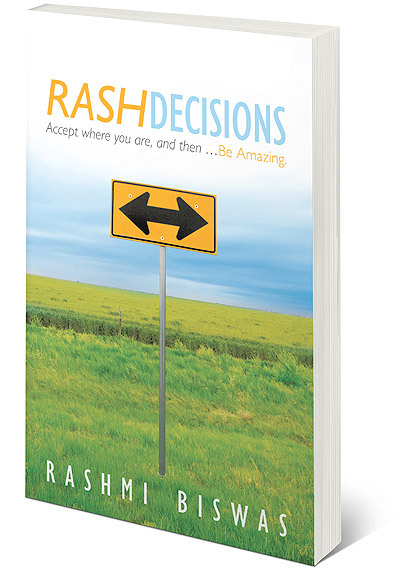 RASH DECISIONS charts the first year of self-employment for Rashmi Biswas who spent several years in the corporate world striving for elusive accolades, total fulﬁllment, and work-life balance. Narrated with honesty (she even shares her food diary) the book incorporates the themes of family friends, politics, gender issues, and yoga set against the backdrop of starting a new business. Throughout the book Rashmi shares stories from her life taking a close look at past decisions, including moving countries and not joining the army. By accepting the decisions she has made Rashmi learns to “meet herself where she is” and applies a business planning model to chart a positive outlook for her future. RASHMI BISWAS was born in Blackpool, Lancashire, and lived in Manchester; Scotland, Kingston, North Yorkshire, and Sheffield before moving to Toronto at the age of twenty-nine. Rashmi has a Masters degree in Human Resource Management from Sheffield Hallam University and spent ten years working in corporate North America in the gaming, car rental, retail, and travel industries before making the Rash Decision to leave the corporate world in 2010. Rashmi is now an Organizational Development expert with Lake and Associates Canada Inc. where she specializes in facilitation, coaching, and team effectiveness. Rashmi currently lives in Niagara with her Lovely Husband.